What was your first memorable experience of Middle-earth? In my case, simply that first reading of The Lord of the Rings at the tender age of 15, just as I was finding my footing as a future illustrator, being enrolled in a graphic arts program in secondary school. Do you have a favorite moment in the books that you return to? There are a number, mostly scenes of pathos, beauty and/or enchantment. The lovingly detailed account of the hobbits' secretive night time detarture into the Shire's Green Hills; their encounter with Gildor's Elves, and then their experiences in the dream-like three chapters that follow their departure from The Shire, (all nearly first drafts) The Old Forest, In the House of Tom Bombadil, and Fog on the Barrow Downs. Further along, the episodes that occur while the Fellowship is journeying tend to have held my interest over the years, and given me inspiration, especially the Lothlorien episodes, the river journey down the Anduin, Fangorn Forest, and Frodo, Sam and Gollum as they work their way toward and through Mordor. The Ithilien scenes continue to inspire, and I fantasize about doing a series of works centred in a particular episode of the larger book. Even now, an obscure scene like Treebeard and Galadriel conversing (at Orthanc) suggests wonder, and Tolkien's breadth of vision. What is it about the mediums that you work in, that you love the most? For my purposes, gouache is versatile for extreme detail, while also perfectly suited to creating oil-painting like traditional imagery that is vivid and print-media friendly. We spoke briefly prior to this interview and it sounds like you’re working on some additional paintings. Would you be willing to share a bit more information about what you are working on? I'm looking to accomplish at least two new, personal paintings in the next weeks, depending on whether/when a few formal commissions I'm angling for materialize. I'm keen to rework the watercolour work by Tolkien titled 'Halls of Manwe; Taniquetil' into a large-scale 'mountainscape' version. Also, having presented my extant paintings and sketches of Beren and Luthien at Mythmoot IV recently, I'm keen to pursue a work long envisioned and much sketched, of Luthien Revealing Herself to Celegorm. I'm also involved in a small commissioned work depicting Dol Amroth currently. 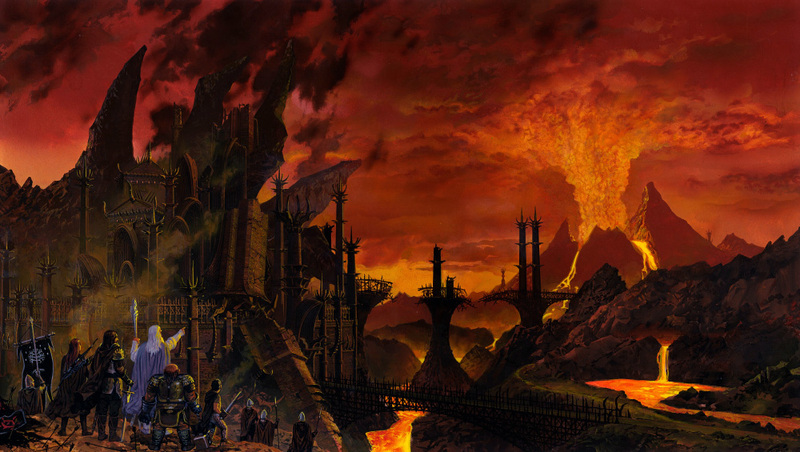 You’ve done 2 pieces for Lord of the Rings Online – the art for our Battle of the Black Gate update, and now for our Mordor Expansion! What are you exploring with these pieces? I wanted both of these works to reflect both the dynamic 'in-motion' experience of the online version of the books in game format, while focusing also on the aesthetic beauty and intricately designed 'sets' players' experience, hoping I've blended my characteristic realism effectively with the architecture that game designers have established. We hear from artists from all walks of life who play our game. For artists looking to get into their work more professionally, what advice might you have? Generally, I try to encourage young aspiring illustrators/artists to be prepared to explore studio work that is not their first choice, while working toward their dream of being successful in the art they are more passionate about. It may require working in non art-related fields, even, but that they should practice the art they love as best they can on their own time, then circulating that art online, and networking as best they can to attract professional interest. If art school training is available, I encourage them to take courses to build up skills and thereby their professional versatility. Some colleagues and I met recently, and our meeting's theme was to present notable artworks we've done that go outside our normal content, techniques or genres. It was quite interesting seeing what that meant for those present. What does Middle-earth offer you as a muse, and given that you've been able to explore this world for some time, what kind of impact does it continue to have? The wonderful thing with Tolkien's vast fantasy is that it is virtually inexhaustible as a source of interesting images. Although I'm long past those heady early years when expressing my passion for the approach to Tolkien I was pursuing burned hottest, it then became a case of both continuing to create new scenes as inspiration dictated (or sometimes formal commissions), as well as moving into applications in publishing or in games (such as the MECCG series from I.C.E.). More recently, it's been interesting, as a now mature artist, to explore reinterpretation of scenes/paintings I'd done earlier, since as someone not formally illustrating LotR or TH, I'm free to allow my ideas of characters, locations, and landscapes to evolve. I nonetheless try to make sure there is continuity with past artworks. I have many many thumbnail drawings of scenes from all 3 main books (QS, LotR, TH), plus a full series of thumbnails from Unfinished Tales (an abandoned project by HarperCollins for an illustrated volume) which I've promised myself ought nonetheless to be realized as paintings in coming years. Those sketches, and any completely new ideas, will keep me busy with Tolkien, on some level or other, for the rest of my life, I expect. Many of our players have grown a deep affinity for the places from Tolkien’s life and travels. You’re taking a trip soon that some of our Tolkien fans would be interested in, yes? Yes, friends in England scouted a camping park in Interlaken, Switzerland near the Lauterbrunnen Valley last year, and we'll join them there this fall. J.R.R. Tolkien and a couple of dozen others trekked through the Alps in 1911, starting near Innsbruck (if I recall), taking them across the mountains for about a month. Tolkien was inspired to imagine Rivendell when he saw Lauterbrunnen and environs at the time, as well as ideas for the Misty Mountains and other places he came to flesh out years after, while composing LotR or TH. Said friends are writing a book on the subject of Tolkien's trek, and suggested my partner and I meet them at Interlaken to see first hand what inspired such wonder in Prof. Tolkien. For players and fans who are interested in your work, where can they find more of it? My website and Facebook pages are the principle sources of information and posted art from me. Many other sources (such as fan art sites) may have some of my art, or present interviews (usually with foreign/domestic Tolkien societies or fantasy journals), but would be difficult to enumerate or even identify. Google Search is the best bet.